YLHS teacher Mr. Eliot is pictured with fellow MIT App Inventor Master Trainers in the back row in between the two gentlemen wearing red under the clock. 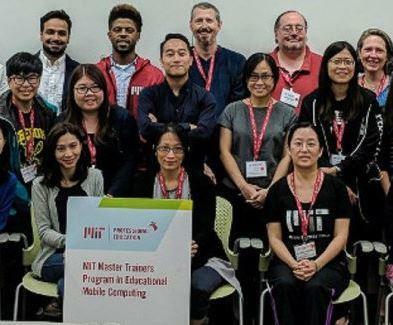 Yorba Linda High School computer science teacher, Dan Eliot, has successfully completed intensive training on all aspects of using and teaching App Inventor with the Massachusetts Institute of Technology, otherwise known as MIT. Now certified, he can teach App Inventor to students, as well as fellow educators. According to MIT, App Inventor is an intuitive, visual programming environment that allows everyone – even children – to build fully functional apps for smartphones and tablets. Those new to MIT App Inventor can have a simple first app up and running in less than 30 minutes. The program’s blocks-based tool facilitates the creation of complex, high-impact apps in significantly less time than traditional programming environments. Mr. Eliot also serves as the E-Sports coach for the Mustangs, and is looking forward to starting a computer gaming pathway of courses for the 2019-2020 school year. Way to be a lifelong learner, Mr. Eliot! To learn more about the MIT App Inventor Master Trainer program, visit appinventor.mit.edu/explore/about-us.html.